Valentine Ioppe grew up in Moscow, Russia and drew his first painting at the age of 13. Being one of the best students of the Moscow University of Architecture, he spent a lot of time studying Russian modernism, and post-impressionism as well as classical art. He also experimented frequently with different sorts of expressive abstraction. 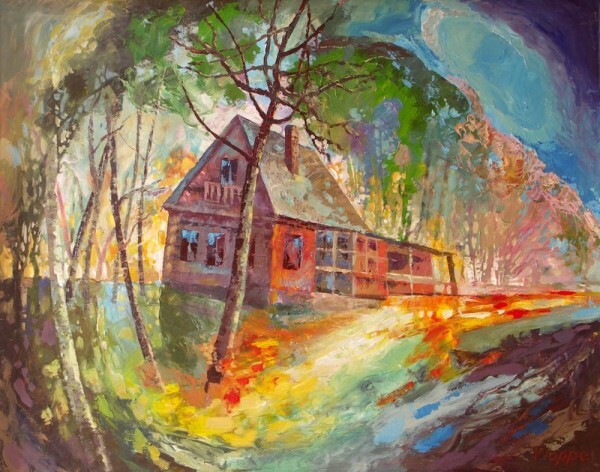 The influence of Wassiliy Kandinsky, Marc Chagall and Pavel Filonov is apparent in his work. Valentine Ioppe is the member of the Union of Artists of Russia and the Association of Architects of Russia. Valentine Ioppe participated in many international exhibitions in: Bulgaria (1982), Germany (1985), Greece (1990), Spain (1997), France (1998) and over 100 exhibitions in Canada, where he has been living and working since 1991. His original paintings can be found in numerous private collections in Canada, Russia, USA, Israel, Germany, Spain,Italy and the Ukraine. Да, воспоминания, этот дом моих друзей и написан по памяти, но он до сих пор стоит, и в нем живут люди. Впечатление такое, что дом этот летит. Как время. Валерий, с новым годом! Не только у вас такое впечатление. Несколько человек, которые видели эту картину, стоя перед ней, сказали, что она "в ЧЕТЫРЕХ ИЗМЕРЕНИЯХ".